Electronic Arts has announced that the NBA LIVE 18 free demo will launch tomorrow for all players with Xbox Live Gold and PlayStation Plus accounts. In the NBA LIVE 18 demo, players can try The Rise, the prologue section of The One – an all-new way to pursue your legacy, centered on the player and defined by your choices. Progress made in The One during the free demo can be carried over into the full game. Players in the free demo will also be treated to specially-timed Live Events – limited-time activities with special rules, rewards and characters, only available in The One. Rewards earned in weekly Live Events will also carry over into the full game. The demo also contains a Play Now match between the NBA Finals rivals Cleveland Cavaliers and Golden State Warriors. Those who enjoy the demo and pre-order NBA LIVE 18 will get 33% off the retail price ($59.99) at participating retailers. EA Access members receive an additional 10 percent discount when they purchase a digital version of NBA LIVE 18 on Xbox Live. 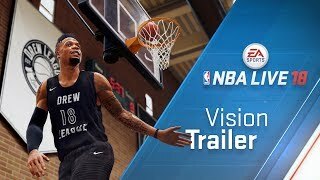 NBA LIVE 18 is developed by EA Tiburon and will be available worldwide September 15 for Xbox One and PlayStation 4. There are currently 0 members and 132 guests on the website right now.